Andersen Solar Cooker on our Solar Deck! The web site quotes a price of $589, when I called they said the basic package was $500, plus shipping, includes the rotisserie motor. I got the extra 6" rotisserie tube. I didn't get the baking cross, as I have some plate aluminum that I'll make into a cross (or a six-pointed star if I decide to make pies??). I was able to use it a few days after it arrived. Here are my initial impressions: The thing is rock solid--the parabola on which the spectral aluminum is laminated is about 1/4" thick. I think it would survive a tornado! The reflector is squarish with rounded corners, kind of like you see sometimes on aircraft carriers--Andersen Manufacturing specializes in the radar gizmos so I imagine they are maybe reusing some reflectors that didn't quite meet exacting radar standards? The aluminum reflector that's laminated on the one I got comes in strips like the illustration in the video, rather than the squares, but pretty much the whole parabola is covered with it. The frame is made with about 1" metal square tubing, the pieces just slip together. The instructions have a few minor ambiguities, and the wing nuts listed were actually those kind of nuts with the rubber lining, no wings...not a critical detail. I had to review the video to see how the rotisserie was put on... But I assembled it in about 1/2 hour. It comes with two wheels and the arms that hold the platform for cooking, the rotisserie motor, etc., double as handles for lifting and rolling the cooker around. My first job for the Andersen Parabolic was a pot of root vegetable soup.I used the motor that comes with it to spin the pot & avoid charring spots in the pot. The motor has a little whine to it, but spins the cooking pot or rotisserie assembly at about 2 revolutions per minute. I can imagine the veggies would have scorched on the side corner of the pot without the motor evening out the heat from the focal point. Temp outside was about 30 degrees F. About 3 quarts of soup began boiling in about 20 minutes. I let it go about an hour (when I spoke with the guy at Andersen while ordering, he said the 2 D batteries with the rotisserie last 30-40 hours--so, they will last for 30-40 pots of soup!). Veggie soup turned out great. I used the pot they list on the web site, which is thick aluminum with non-stick surface inside. I'm always a little leery about using non-stick pots & pans on the parabolic, due to the concentrated heat in one spot, but again the motor appears to make that point moot. The focal point being projected onto the *side* of the pot/pan is not usual or standard for parabolics--most have the focal point that goes mainly under the cooking vessel. In the video on the above web site, it looks like the cake the guy was cooking was slightly charred around the edges--but as you can see, he didn't use the motor, just turned the pot around now and again. The charring looks only to be on the surface, but more frequent turning with the motor probably would've prevented that. All in all I really like the cooker so far. Although on the heavy side, it's easy to maneuver around our already crowded solar deck. It's built to last, and "performs as advertised." Thank you very much for that detailed review of your latest solar cooker. We are glad to have such an expert review of this latest parabolic cooker available to the public. We appreciate your opinions and observations, especially from one as knowledgeable as you are about solar cooking and of the many kinds of cookers available to the public. The Andersen Parabolic does look like a nice, well built solar cooker. There are NO visible dates for this article, nor ANY of the comments which follow. WHY??? It diminishes context & relevance (among other things) & makes EVERY-THING contained with-in this article/page next-to-USELESS (I.M.O.) w/o a reference-point. I, could give SEVERAL more reasons why the dates matter, but, it's kid of a moot-point, as it's soooo late-in-the-game. i.e. -- due to the LONG-passed cessation of production, of the Anderson unit. Diff to fathom why these (date-line) omissions exist. Don't feel too bad; there are plenty of other sites, which have the same issue. That would be sad news if they didn't make the Andersen cooker any more. I see there's a new web site (at least newer than the one I found it on) - theandersensolarcooker.com My theory is that Andersen, which makes satellite dishes, didn't have a lot of extra to do to make the cookers. 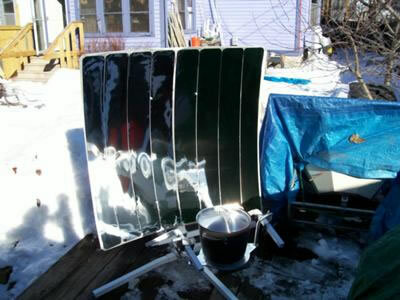 We heard through the grapevine that this solar cooker is not available anymore. It would be nice if it could be improved upon and reintroduced again some day. It did have quite a few good features. Good to read some firsthand info about this cooker! Does it break down at all or, once assembled, stays that size? It looks large and it would be cool if it folded somehow. How about 4 square yards of reflecting surface or bigger to get the cooking done much FASTER! Anyone?? The bigger the better! As matter of fact, I built a crude array of aluminum foil reflectors totaling over 200 sq ft to heat the shady backside of my house that faces to the north where the sun is never there. It works great. No need to chop wood at all! Plus free lighting indoors, a bit bright though. I used regular 4x8 plywood sheathing boards each with 32 sq ft . I reused them to reflect back the hot sun during the summer to keep my home cooler. I save $$ on air conditioning. Thank your for visiting our site and for your insight on heating and cooling with a "large reflective surface". For solar cooking, something the size you are considering, would be a bit more than most people could feasibly handle and use practically, but for the applications you described using it for, I think it is a great idea...something I would like to try.